Santa Claus is Coming to Chappaqua Tomorrow! 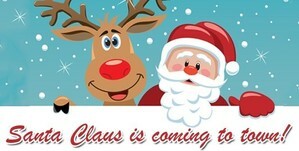 Santa Claus is coming to town this Saturday, December 22nd, from 12-3pm. You are invited to meet Santa on the sidewalk outside Ibiza Kitchen (76 King Street). Photo ops welcome!